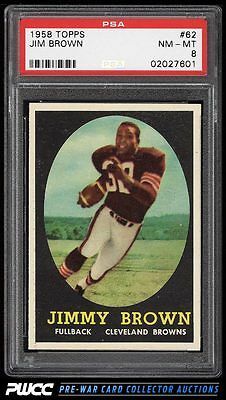 A very strong Jim Brown RC which outshines many examples in the hobby. Exceptional NM-MT+ card stock and pack fresh surfaces abound. Some typical print snow is perhaps all that keeps this from grading even higher. A stunner, worthy of serious consideration. One of nearly 20,000 cards, lots, and sets up for bid in our 7th Auction of 2016. Click on the link above to view the other PWCC auction lots.